1. The club championship was actually won by a guy named Ted Virtue—an objectively hilarious golf name. Virtue is a CEO at an investment firm and a solid athlete, and he won the tournament without competing against Trump, who wasn’t competing because, we’ll remind you, he’s president. 2. The next time Trump saw Virtue, he had “some fun with him,” per Bamberger, eventually challenging him to a nine-hole “winner takes all” match for the title that Virtue had already won. What this actually means is that Trump probably wouldn’t shut up until Virtue accepted his dubious proposition, and there was probably some soft intimidation baked in. 3. Virtue accepted, they played, and Trump won. 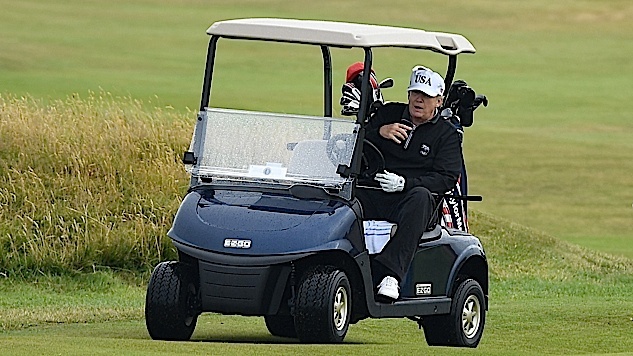 There was no rules official on the scene, and based on everything we know about Trump’s history with golf (and literally everything else in life), he probably cheated. Now, obviously this isn’t the worst Donald Trump story. He enacted a policy that separates small children from their parents; in the grand scheme, stealing a club championship from some other rich guy isn’t the world’s greatest crime. And yet, I submit that in microcosm, it paints a perfect picture of our president—a man with no sense of morality who is obsessed with status and will stoop to any grift, of any size, in order to feed his ravenous ego.